Have you ever met someone so different that you thought they could almost be from another planet? Murder on Muritai, set in a New Zealand populated by humans living alongside alien refugees from the dying planet Ryxin, may be all the proof you need to take another look at those a... read full description below. 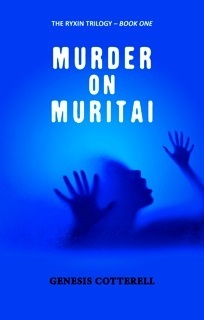 Murder on Muritai is set in a New Zealand populated by humans living alongside alien refugees from the dying planet Ryxin. It is here that Private Investigator Curtis McCoy is called on to investigate his first case. Beautiful half-blood Ryxin Janux Lennan believes her husband was murdered and she wants Curtis to find the killer ...or killers. They embark on their pursuit and find more than they expected. Muritai Island is situated somewhere off the coast of New Zealand. It is a small community which has as its inhabitants some very unsavoury characters. Their mission - to take back the rights they lost when they first landed on Earth, and to eventually take over the planet themselves. Genesis Cotterell has worked for many years in the health sector and spends her spare time writing. Born in Wellington she now lives in sunny Napier, Hawke's Bay, New Zealand.